For years now, Eric Shendelman has been on a mission to spread awareness about drowning prevention and water-safety. As the president of the Ontario Camps Association (OCA) and a representative of the Canadian Drowning Prevention Coalition he is an advocate for spreading the word about children and youth learning to swim. In 1992 he founded Shendy’s Swim School, a Toronto based swim school that teaches people of all ages how to swim. If anyone knows about water-safety standards at camps in Canada, it’s him. Before the summer camp season starts he conducts safety training with many camps in order to meet standards. Shendelman also advises camps to “know the swimming area by checking the surrounding environment for any hazards.” Water hazards include, but are not limited to, broken glass, hidden underwater dangers, such as rocky bottoms and shallow areas. Even if the camp is using a third-party swimming area all OCA-member camps must follow the same standards. “Ask questions about the location’s safety plans in cases of emergency ahead of time,” Shendelman says. When campers first arrive, many camps assess a child’s swimming ability with a swim test in shallow areas. However, it’s still really important for parents to update camp staff about their children’s swimming skills. This information will help camps to determine an appropriate minimum ratio of camp staff to campers, and to ensure that ratio is maintained at all times during the summer . And while supervision is required, if your child is a non-swimmer, a camper with special needs or under the age of five, additional supervision can be provided if necessary. And implement barriers – the swimming and/or waterfront beach area must be clearly designated by signs and buoy lines and buoys. 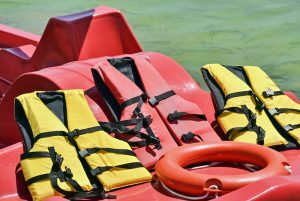 When it comes to any aquatic activities, such as boating, kayaking, canoeing, camps have to comply with regulations for licensing, as well as follow all safety requirements. Not to mention have certified and knowledgeable staff. “Before camps can open up for aquatic activity they need to ensure equipment has been checked for damage and give all parties involved online training before they enter the water,” Shendelman adds. It’s also important for parents to be aware of the types of aquatic activities available at the camp. If you have any questions or concerns Shendelman advises parents/guardians to address them before camp starts and to disclose medical conditions to camp administration so that staff are fully prepared to provide your child the support they need in cases of emergency.